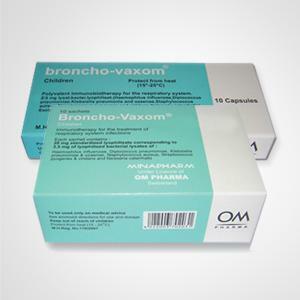 Broncho-Vaxom is an immunsotimulant for prevention and prophylaxis of upper and lower respiratory tract infections, available as Capsules and Sachets. Otitis media is inflammation of the middle ear, Middle Ear infection. It occurs in the area between the tympanic membrane and the inner ear, including a duct known as the eustachian tube. It is one of the two most common causes of an earache, the other being otitis externa. Diseases other than ear infections can also cause ear pain, including cancers of any structure that shares nerve supply with the ear and shingles which can lead to herpes zoster oticus. Though painful, otitis media is not threatening and usually heals on its own within 2–6 weeks. Pharyngitis is caused by swelling (inflammation) of the pharynx, which is in the back of the throat, between the tonsils and the voicebox (larynx). 1 capsule for adults contains: Lyophilized bacterial lysates of Haemophilus influenzae, Diplococcus pneumoniae, Klebsiella pneumoniae and ozaenae, Staphylococcus aureus, Streptococcus pyogenes and viridans, Neisseria catarrhalis: 7 mg.
1 capsule for children contains: Lyophilized bacterial lysates of Haemophilus influenzae, Diplococcus pneumoniae, Klebsiella pneumoniae and ozaenae, Staphylococcus aureus, Streptococcus pyogenes and viridans, Neisseria catarrhalis: 3,5 mg.
Prevention of recurrent infections of the airways and acute infectious exacerbations of chronic bronchitis. Comedication in the treatment of acute airway infections. Preventive treatment and/or consolidation therapy: 1 capsule daily on an empty stomach during 10 consecutive days per month for 3 months. Treatment of acute episodes: 1 capsule daily on an empty stomach until disappearance of the symptoms (but for at least 10 days). In cases in which antibiotics are needed, the administration of Broncho-Vaxom should be associated preferably from the start of therapy. The capsule can be opened and the content poured into a drink (water, fruit juice, milk, etc.). Preventive treatment and/or consolidation therapy: 1 capsule daily on an empty stomach during 10 consecutive days per month for 3 months. Treatment of acute episodes: 1 capsule daily on an empty stomach until disappearance of the symptoms (but for at least 10 days). In cases in which antibiotics are needed, the administration of Broncho-Vaxom should be associated preferably from the start of therapy. Does Broncho-Vaxom® interact with corticosteroids or antihistamines? Immunodepressed patients: Can Broncho-Vaxom® be given to AIDS patients? 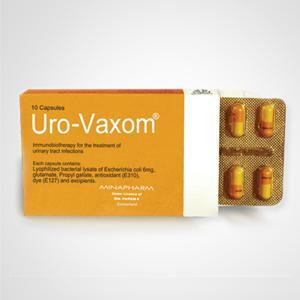 Time of dose: When should Broncho-Vaxom® be taken? Ideally, in the morning on an empty stomach. Anti-viral action: Does Broncho-Vaxom® have an anti-viral action? Mechanism: How can oral Broncho-Vaxom® have an effect on the general immune response? Vaccination interaction: Can Broncho-Vaxom® be given along with vaccination? No, Although there is no interaction, there should be an interval of 1 week between them. 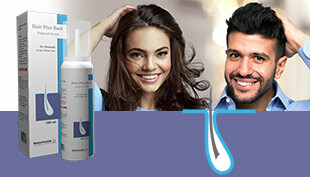 Non-specific or specific: Which action does Broncho-Vaxom® have? Period of effective protection: After taking Broncho-Vaxom® over a 3-month period, how long can protection be expected to last? Children: In view of the fact that the child’s immune system requires time to mature, from what age should Broncho-Vaxom® be given? Cost: If a patient is already (and necessarily) taking antibiotics for a serious acute infection, isn’t a prescription for Broncho-Vaxom® simply adding to the costs of treatment? These have solved the immediate problem but have not prevented infection recurrence. 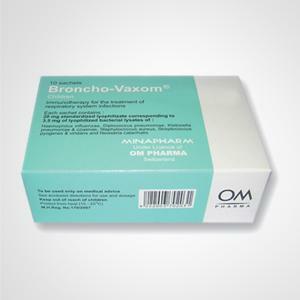 Broncho-Vaxom® will reduce the recurrence rate and so, over time, that patient will have fewer infections thus eliminating the need for antibiotics and hence reducing the costs of treatment. There is no syrup form?! The formulation is unstable in liquid form. That is why such formulation does not exist. The dose seems to be complicated. 30 days (10+10+10) administration over a 3-month period provides 6 months coverage. At what time of the day is it best to take the Broncho-Vaxom Capsule/sachets? The capsule/sachets should be taken in the morning on an empty stomach; it is the best time to obtain the optimal effect of the product. My baby is 13 months old. I breastfeed her in the morning at 7 a.m., but she is very sleepy then and I don't think I could give her the sachets first thing in the morning. She "officially" wakes up around 9:30 a.m. and eats between 10 and 10.30, a meal that consists mostly of fruits & cereals/biscuits. Is it OK to give her the sachet before this meal, or should I try to give it in the morning before breastfeeding? Effectively, Broncho-Vaxom is recommended to be taken before breakfast. But in this case you describe, Broncho-Vaxom can be given to your baby before the fruits/cereals at 10:00 or 10:30 with preservation of the properties of the product. My daughter is 7 years old. Is it a problem if she has breakfast after taking BV? Are there any strict rules regarding having breakfast after taking BV? The instructions recommend one hour interval between taking BV and breakfast, but I would prefer having breakfast before she goes to school. Is 15-20 minutes interval enough? There is no problem that your daughter takes the Broncho-Vaxom capsule/sachets with a 15-20 minutes interval. The instruction of taking the medication on an empty stomach is a general one to avoid interference with a fatty diet which is generally not the case of a breakfast for children. Moreover it is recommended for children who have difficulties in swallowing the whole capsule/sachets to open it and mix its content with some food at breakfast, and this has not been shown to have a negative impact on Broncho-Vaxom's efficacy. 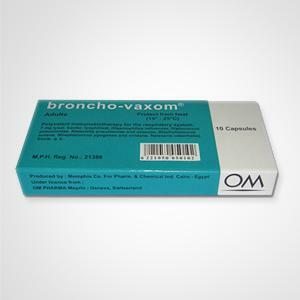 Broncho-Vaxom is an immunostimulant for prevention and prophylaxis of upper and lower respiratory tract infections available as sachets. Immunostimulating agent for prophylaxis against recurrent urinary tract infections.